Guided city tours in Pashupatinath, Buddhanath, Swaymbhunath (Monkey Temple) and Patan Durbar Square. Explore the beautiful city of Pokhara. Experience of 5 star accommodation in Kathmandu and Pokhara. Kathmandu, Chitwan, Gorkha and Pokhara tour combines the great architecture & rich culture of Kathmandu valley, wildlife activities in Chitwan National Park, Historical Gorkha Palace and the natural paradise of Pokhara valley. Strolling around the medieval city of Kathmandu valley, full of amazing architecture which helps you to know the ancient history of Nepalese Kings, art and various cultures that will inspire your soul and rejuvenate your life. Wildlife tour in Chitwan includes elephant back rides to see the wild animals in the National park, canoe trip in Rapti river along the dense sub-tropical jungle, elephant bath and the cultural dance of Tharu community in the evening. When you reach Pokhara city to see closer views of massif Himalayas in front of your eyes, you will get a heavenly feeling, a lifetime memory to boast about. 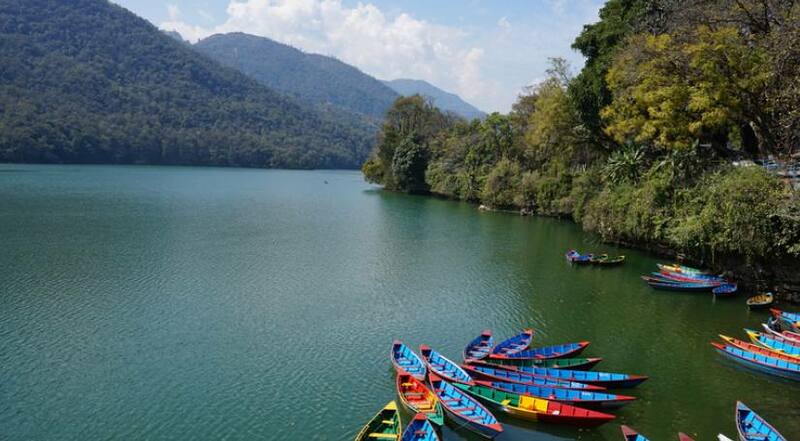 Furthermore, the beautiful and peaceful Pokhara is full of beautiful lakes, caves, mountains and such charming natural sceneries. Boating, strolling around the mountain and mesmerizing sunrise views in the Himalayas is the best part of this week trip to Nepal. 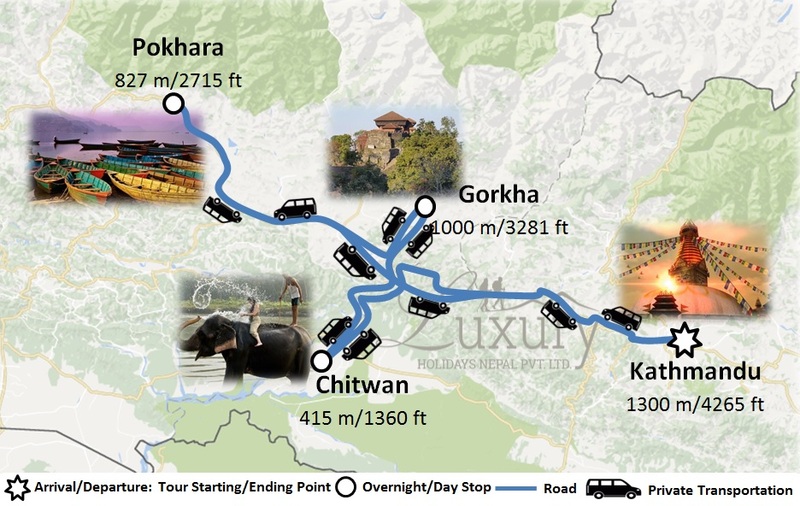 We start this 9 day tour to Nepal from Kathmandu Valley, visiting UNESCO World Heritage Site cities of Kathmandu, Patan, Boudhanath and Pashupatinath. Then, drive to Sauraha, Chitwan to explore the Chitwan National Park that has an important place in preserving the rare wild species of this planet. Next is drive to Gorkha, a scenic hill town that holds a great historical significance of King Prithvi Narayan Shah who unified Nepal. From Gorkha, you will continue your journey to the amazing Lake City of Pokhara. The trip embraces some of the most grandeur nature, cultural, and wildlife display of Nepal as well provides an opportunity to mingle and experience the ethnic lifestyles of local people. You will enjoy luxury 5 star accomodation in Kathmandu and Pokhara. After arriving in Kathmandu, a representative from Luxury Holidays Nepal will pick up from the airport and take to your hotel. In the afternoon, you may take a rest or visit Luxury Holidays Nepal’s office. At evening, we host a pre-trip meeting at your hotel in Kathmandu and introduce your tour guide. Please seek this opportunity to ask questions about your trip. This includes a final briefing and preparations for the trip. For the meeting, please make sure you bring your passport, one passport-size photo, and a readable copy of your travel insurance policy. Please inform us in advance if you will be arriving late and therefore are unable to attend the pre-trip meeting. After the pre-trip meeting, there will be a welcome dinner hosted by Luxury Holidays Nepal. For dinner, you will be served authentic Nepalese cuisine, which will introduce you to the country’s food culture. Patan Durbar Square:located in central of city Lalitpur. It displays the Newari architecture that had reached its pinnacle during the reign of Malla kings who were great builders and patrons of the arts. Activities in Chitwan include: Lunch followed by a tour of Tharu village and park visitor center. Sunset view from Rapti River, dinner & cultural program. Overnight at Chitwan. Activities in Chitwan include: Canoeing & jungle walk or a visit to the elephant breeding center. Lunch followed by an elephant safari with evening entertainment. Overnight at Chitwan. After breakfast, drive to Gorkha a scenic hill town with the great historical significance of King Prithvi Narayan Shah who unified Nepal. So, the main thing to visit here is the interesting Gorkha Durbar (Fort) with great mountain views of Annapurna, Manaslu and Ganesh Himal range to the north and Gorkha sight-seeing including the Museum, Gorkhanath temple, an interesting carving of Hanuman, Kalika Mandir a temple dedicated to the goddess Kali. Overnight at Gorkha. After breakfast, leave Gorkha for Pokhara (known as The Lake City owing to a large number of lakes in the city). The road first passes through the subtropical jungles. As you leave Gorkha, the landscape changes. You will see hills, small settlements and terraced farms. Upon your arrival in Pokhara, the beautiful lake city, you are rewarded with magnificent views of the Himalayas, including Dhaulagiri (8,167m), Manaslu (8,156m), Machhapuchhre (6,993m), the five peaks of Annapurna and others. Check-in to the hotel and take a rest. You may also stroll in the streets of Pokhara and just enjoy being in one of the most beautiful cities of Nepal. The revered Gupteshwor Cave is situated 2 kms from Pokhara airport. The entrance is right across from Devi’s fall and the cave is almost 3 kms long. This cave holds special value to Hindus since a phallic symbol of Lord Shiva is preserved here in the condition it was discovered. It is the second largest lake in the kingdom. With the Barahi Island Temple in the middle of the lake it is the most important religious monument in Pokhara. Carved by Seti-Gandaki is one of the natural wonders of Pokhara provides a perfect view of the river’s dreadful rush and the deep gorge made by the turbulent flow of white water. You have an option of both driving as well as flying back to Kathmandu. The Pokhara-Kathmandu flight swifts along the Himalayas unveiling Manaslu, Ganesh Himal and Langtang ranges. After returning to Kathmandu, you have the afternoon and the evening to stroll along the streets of Kathmandu for some last-minute shopping. There will be a dinner and half hour massage in the evening to celebrate the successful completion of your journey. Overnight at 5 star hotel. You have the option to extend your trip to continue onto rafting adventure, Kathmandu valley shopping tour, mountain biking and other activities. Accommodation in Kathmandu in 5 star hotel (Soltee Crowne Plaza, Gokarna Forest Resort or similar Category) including breakfast on twin/double sharing bed & breakfast basis. Accommodation in Pokhara in 5 star category hotel (Pokhara Grande or similar category) including breakfast on twin/double sharing bed & breakfast basis. 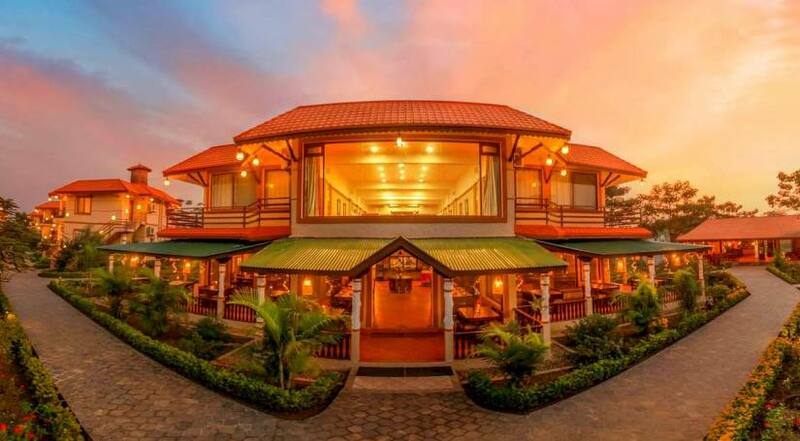 Accommodation in Chitwan in 4 star category hotel (Hotel Greenpark or similar category) including breakfast, Lunch and Dinner on twin/double sharing bed & breakfast basis. Accommodation in Gorkha (Hotel Bishauni or similar category) including breakfast on twin/double sharing bed & breakfast basis. Welcome dinner with cultural program. Lunch and Dinner while you are in Kathmandu, Gorkha and Pokhara(Meal costs about 3 -7 dollars per item depending on the place where you eat). Luxury Holidays Nepal provides you 5 star hotels in Kathmandu (Soltee Crowne Plaza, Gokarna Forest Resort or similar Category) and in Pokhara (Pokhara Grande/Hotel Mount Kailash resort or similar). 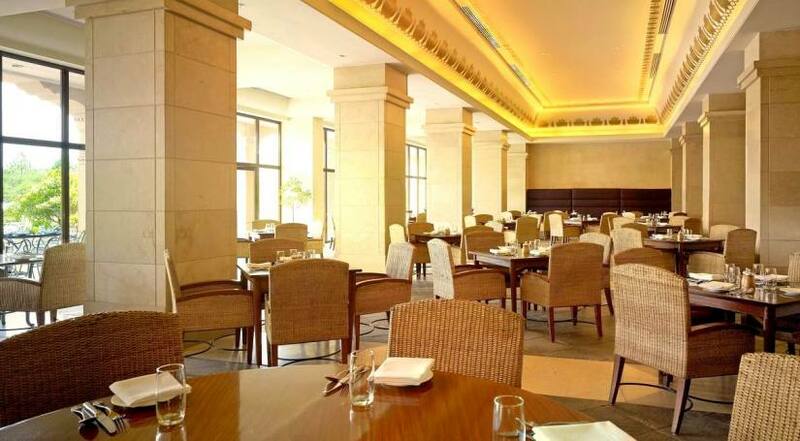 In Chitwan, you will be staying at the 4 star Hotel (Hotel Greenpark/Hotel Seven Star or similar Category) and in Gorkha (Hotel Bishauni or similar Category). Some major currencies (USD, AUD, and EURO) are accepted for both visa and in general. There are plenty of ATM's in Kathmandu and credit cards are accepted in limited shops and many restaurants.